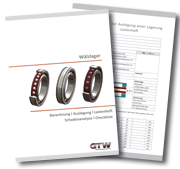 GTW is developing and producing solutions for mechatronical systems, for electrical motors and for spindle units, based on high-end bearing technology. The experience and the know-how were gained over more than 20 years. It resulted in many patents, forming the basis for the development of either new products or decisive improvements of customer models already existing. The responsible handling of energy consumption in all sectors shows up in our designing results which characterize themselves by highest precision, durability and maintainability. A number of leaflets, providing detailed technical information can be downloaded as pdf-files in our Downloadarea.